Women of all ages are invited to gather on Wednesdays in Gilmore Hall from 6:30-8:00 pm to explore Lisa-Jo Baker’s book, We Saved You A Seat, where you will learn how to find and keep lasting friendships. There is a $20 fee for materials, and books will be available the first day of class. Simply believing God exists is not that important … it’s knowing God that matters! Join this group of men on Wednesdays as they embark on a weekly journey to know God as a series of special guest speakers each tackle a different attribute of God. Join this group each week, led by Ferol Null, for hymns and choruses, prayer requests, testimonies, and a series on the healings of Jesus in Matthew. If you are struggling with grief, along with the disappointments and chaos of life, you are invited to this Grief Support class. The study will be from the book Good Grief by Granger E. Westberg. No matter the cause of your grief, you are encouraged to come. Come lift your voice and have fun with a great team in the Worship Choir on Wednesday nights. 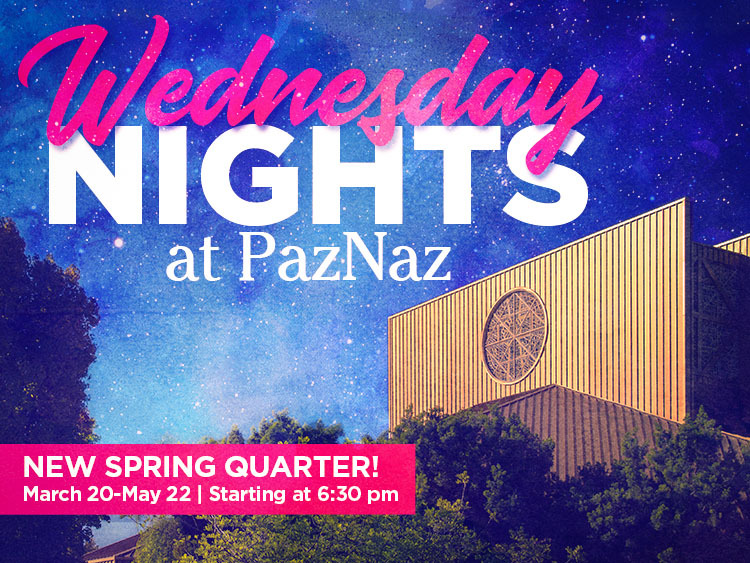 The Armenian Christian Outreach of PazNaz invites you for a time of prayer and Bible study on Wednesdays. This group meets year-round. Join this group for prayer, worship, and Bible study as they go through the book of James in both Chinese and English. This group meets year-round. While parents participate in Wednesday night activities, our preschoolers are engaged in play, Bible stories, snacks, and crafts. Come to COW (Creating on Wednesdays) as we worship, play games, do crafts, and travel back in time to learn how Moses, Joshua, and Caleb lived and served God. On Wednesday nights during the spring semester, students will gather together for open gym, games, food, fun together, music, and a message about what it looks like to walk in the way of Jesus. Everyone is welcome, so tag a friend to join you! Oasis is a ministry program for special needs teens and adults. Come for a time of food, fun, friendship, and learning from the Bible. This spring, Oasis will be studying the book of Colossians.